4 Beds 2 / 0 / 1 Baths 2,484 Sq. ft. Description: Great centex home in planned community. 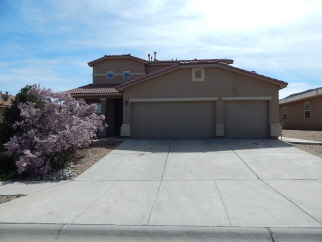 Well maintained, 4 bedrooms, 2 living areas, 2-1/2 baths. Master bedroom is downstairs and other bedrooms are upstairs. 2 units heating and 2 units refrigerated air conditioning. All fresh interior paint and brand new carpet throughout. 3-car oversize garage. Large covered patio is great for entertaining and outdoor bbq. Tile roof adds lots of street appeal. Just minutes to i-25 and 20 minutes to albuquerque. Close to walking trails, parks, shopping, theater and excellent schools.